This summer, Toronto experienced designated art crawls running all summer long across Eglinton! Gallery City was a showcase of over 100 local businesses and 35 artists in street-side art galleries.  Check back next year for details on Gallery City 2019! Eglinton is a destination within the city, ripe for exploration. Each community offers a unique shopping experience and has something for everyone. 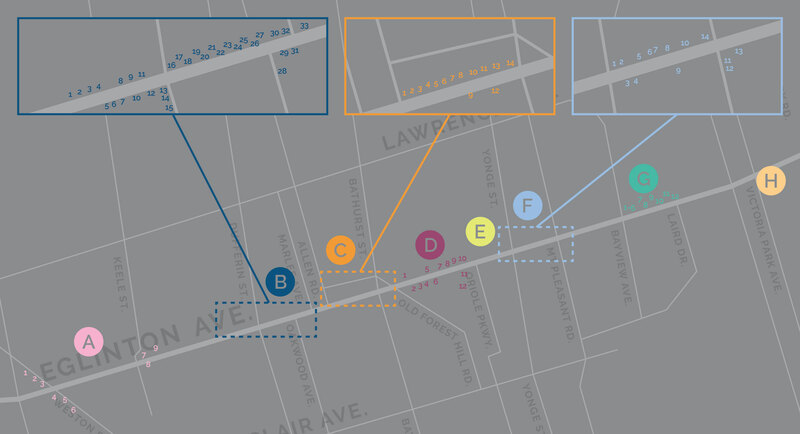 To complement this varied corridor, we have selected a diverse range of artists to showcase their artwork along Eglinton. Like the diverse business communities, each of the artists’ galleries will also be unlike any other and appease the tastes of all Torontonians. Gallery City is a joint initiative of Metrolinx, Crosslinx Transit Solutions – Constructors (CTSC), the seven Eglinton Business improvement areas, the Yonge Eglinton Centre, Eglinton Square, and Eglinton businesses between Weston Road and Victoria Park. To secure the art for the initiative, Gallery City has partnered with local non-profit arts organizations along Eglinton Avenue, including Urban Arts, Art Starts, Scarborough Arts and the Artbarn School. The original Gallery City concept was conceived in partnership between the York-Eglinton BIA and Hogtown Mascots, under the artistic direction of John Kernaghan, in 2013. Explore a collection of art from Catherine Shea, titled ‘Chaos Theory,’ showcased at the 20 Eglinton Ave. West entrance. Experience art inspired by life and nature, curated by Scarborough Arts, on display in the main N/S aisle. Our artist roster includes artists living and hailing from neighbourhoods across the city. ?The art speaks to their diverse experiences and backgrounds, and their strong connection to their communities. Come to Eglinton Avenue this summer and discover their art, and find your own inspiration. The art pieces featured below are available to be won in the Gallery City contest. To enter, visit your chosen art crawls, note the artist codes of your favorite artists, and enter the artist code on your ballot (in store or tỷ lệ cá cược bóng đá trực tuyếnonline). "We The North" is a gallery that includes pieces that pay tribute to the City of Toronto and the connections between us. Esam Jlilati was passionate about visual arts and architecture since his childhood and had always aimed for a career as a painter. However, his father believed that art was reserved only for the rich, but not for those who needed to make their own living. Therefore, he chose engineering as the focus of his formal education and architectural design as a career. ?When he began studying in Darmstadt Germany, he managed to continue painting parallel to his other career. After his immigration to Canada in 2004, Esam decided to bring art to the professional level and make it his primary career. ? ?He has delivered lectures and wrote articles about artistic techniques and architectural history, which makes him renowned through local and international journals and magazines. Upon viewing his works, it becomes obvious the inordinate amount of time the artist labours over them so as to make them unique and thought provoking, and some of his paintings are detailed to the point of being microscopic. Thiviyaa is an artist from Toronto, Ontario also known as Art By Thiviyaa. She works hard to create pieces that speak to the beauty of the world around us and how it moves her. She aims to weave stories for others, immersed in the mystics of Mother Nature. Imagine a world untainted by humans and how Mother Nature was intended to be. Her artwork captures more than a mere moment of nature but its fluidity and movement through time. It's a narrative. Thiviyaa puts her heart on the canvas and Canada's landscape has always been her muse. Her process and style is greatly influenced by Emily Carr, Monet, Van Gogh & Pollock. Their ability to evoke emotion resonates strongly with her. As a self-taught artist, James works hard to create images that intrigue and inspire. Street photography — the art of capturing candid images in everyday life — allows him to document the world around us, moment by moment. Surroundings become theatre, and with it, a myriad of stories and characters. Art has always been a part of his life; his father was an artist and he inherited his talent for drawing. His father also took up photography as a hobby in his later years, and James followed in his footsteps in 2016 when he picked up his first digital SLR. Street photography is a natural extension of his professional background in story-telling through journalism and communications. He is a graduate of Ryerson’s journalism program and has worked in print and TV news media. James is a member of Scarborough Arts and has exhibited at its annual Art in the Park festivals. Melissa Lende is a Toronto born artist and has had a fascination with art from an early age. She started drawing and painting in her teens and has continued into adulthood. In university she took photography courses as well as obtaining her BA in psychology. She is a teacher and has always included art in her lessons to engage children. She has studied under featured artist Catherine Shea. Melissa’s abstract paintings include a bold use of colour and texture. She includes various techniques in her paintings to create movement and feeling. Melissa’s paintings are in private collections within Toronto. Jude ?Ifesieh ?was ?born ?in ?Nigeria, he ?first ?came ?across ?a ?pencil ?at ?the ?age ?of ?three ?and ?has ?never ?quite ?let ?go ?of ?it ?since ?then. In ?2011, Jude ?moved ?to ?Canada ?to ?study ?Digital ?Animation at Centennial College. In ?Canada ?he ?has ?shown ?his ?works ?at ?the ?Toronto ?Library ?Exhibition; Paint ?spot ?Exhibition, Edmonton; ?Art ?Vancouver ?Exhibition ?to ?mention ?a ?few. Through ?his ?travels,notably ?in ?the ?U.S. ?as ?well ?as ?Australia, his ?art ?has ?been ?expressed ?as ?life ?-art ?is ?synonymous ?with ?healing! ? As ?an ?artist, ?he ?has ?developed ?pieces ?using ?a ?range ?of ?colors ?with ?unique ?grass-like ?strokes. ?This ?is ?a ?time-consuming ?process, ?as ?I ?layer ?and ?build ?up ?the ?images ?step-by-step. ?I ?have ?experimented, ?not ?merely ?to ?create ?images ?or ?figures ?in ?true ?realism; ?but ?rather ?with ?careful ?brush ?statements ?in ?strokes, ?movements ?that ?express ?the ?energy ?of ?the ?subject. ?My ?work ?involves ?a ?synthesis ?of ?multiculturalism ?and ?environmental ?themes. "International" is a gallery truly composed of works from far and wide. The pieces reflect international modes of creating, in addition to reflecting international spaces and places. Camila, born in Peru (1988), began to draw and paint at a young age, attended different types of visual arts classes, then received her BFA in Drawing and Painting and illustration at OCAD University. Her main influence is Peruvian art, Vincent Van Gogh, and Chuck Close. ?Her works are often created in bold colours and energetic brush strokes, playing with other materials and techniques. ?Her art has appeared in an OCAD textbook and exhibited in group shows and live paintings events in Toronto and Lima. ?She also makes both digital and analog illustrations for children’s books, online blogs, magazines and private client commissions. Susan L. Brown is an artist, educator, curator, and sometimes poet. She is the founder of the Artists’ Garden Cooperative, a summer arts and education conferencing program, and Artify, a curatorial service. A native of Toronto, Susan studied Fine Art and completed a Bachelor of Education at the University of Toronto. She is an award-winning visual arts educator and artist. As a practicing artist, Susan has been a member and exhibited with the Woodlawn Pottery Studio, the Don Valley Art Club (DVAC), the Bayview Art Tour, and the North Toronto Group of Artists (NTGA), and has participated in solo and group shows at the city of Toronto’s Market Gallery, Paper Mill Gallery, Ben Navaee Gallery, the OSSTF Gallery at Mobile Dr., and Capital One Corporate offices. Her work is in private and corporate collections in Canada, the US and Israel, including: Sunnybrook Hospital and Toronto Hebrew Memorial Parks. Magdalin Livingston is a recent graduate of the University of Toronto, having studied English, Semiotics, Literature and Critical Theory. She has a passion for community involvement, teaching, and the arts. During her studies, Livingston has worked with non-profit children’s theatre company, Right Path World Arts, teaching visual arts to primary school students in the North York region. Livingston also co-hosts creative-driven workshops for local up-and-coming artists in the GTA. She intends to continue her work with youth and various artists in the community while studying at the Ontario Institute for Studies in Education, in the Masters of Teaching program. Livingston’s work has been featured in showcases such as the Design Exchange Museum’s, “Ain’t I a Woman, I am a Man” (2017), UofT’s Black History Month Exhibition (2017 and 2018), as well as UofT’s Literature and Critical Theory journal F.U.N. Deon Best is a multidisciplinary Toronto artist with a background in Graphic Design, Digital & Traditional Art. Deon Best’s portfolio covers a wide range of artistic mediums, with currently his main-focus being Modern Batik Art. Deon Best was trained & mentored by master Batik Instructor David Kibuuka. As an artist and instructor Deon Best has taught numerous workshops, classes & camps across Ontario to all ages for over the last 5 years. He has also been creativity involved with several Canadian organizations. Utilizing his talents for charitable works and the positive empowerment of children, youth & adults through art is a passion. Deon Best is always looking towards the Horizon for his next artistic inspiration, adventure & challenge! Toronto-based Nigerian multidisciplinary artist, Ugonna 'gunna' Ikechi, seeks to unify the love of thought-provoking art and aesthetically pleasing expression by cultivating elements of sincere visual language. tỷ lệ cá cược bóng đá trực tuyếnthegunnavision serves as a conduit for the artist's visual expressions through a variety of media with his focus being pencil/ink drawing, photography, graphic design, film, and most particularly, acrylic painting. Jacquie Comrie Garrido is a Panamanian fine artist, whose vibrant body of work has been transforming dull indoor and outdoor spaces for communities in Canada and abroad. In paintings, prints or large scale murals, Jacquie uses colour and movement as primary elements to depict the dynamic, inevitable natural process of all beings: alchemy and transformation. Dedicated to the belief that art ignites change, and in today's overwhelming state of the world, her mission is not only to strengthen communities through art, but to create positive, inclusive spaces in service of social healing, mental health and wellness. "Portrait" is a gallery composed of pieces by various artists that draw attention to people, facial expressions and looking deep into the soul. Shafia Shaikh is an emerging visual artist based in Toronto, working primarily with acrylic andspray-paints. She believes in artists bearing a responsibility to document and comment on their environment through their work. Shafia appreciates visual art’s unique ability to confront social issues and injustices, while also allowing for individual reflection. She hopes to use her work to bring awareness to lived experiences of people of colour, as a means to contribute to change. Her work consists of paintings, illustrations, and murals, which focus on community engagement and sharing authentic narratives through accessible public art. Shafia is also the founder of The E.W.o.C. Project, an initiative committed to creating art that highlights the complex narratives of women of colour and challenges the stereotypes held against them. Proceeds from all work are donated to organizations/charities involved in activism for marginalized groups, on a local and global scale. Anya Mielniczek is a Toronto based Polish-Canadian artist who grew up between the city in Canada and the country sides of Poland. As a mixed-media artist, her work explores combinations of both fine art and street dirt mediums. Mielniczek takes easily discarded materials such as plastic bags and candy wrappers adding value to what otherwise is considered trash, while drawing attention to our consumeristic tendencies and the implications this has on our environment. Inspired by waste, moody images and the treatment of our natural resources her pieces are emotionally charged, experimental and responsive to the time and place she’s creating in. The artist’s work is both figurative and representational, compiled of layers, textures, and the energy felt in unaltered lines. Decidedly playing between a real and fantastical aesthetic forming a greater narrative pertinent to environmental change –informing herself as well as viewers, of the obstacles our finite world faces in light of our hyper consumption. Having graduated from Queen’s University in 2012 with a BFAH, Mielniczek completed a yearlong fellowship with The Living Arts Centre in Mississauga in 2014 and most recently was an artist in residence for a 9 week duration at INSTINC Studios in Singapore, 2016. Komi Olaf's work is an extension of who he is. A direct representation of his character and experiences. While completing a Masters in Architecture, he developed a passion for both painting and poetry and has been on a mission to fuse these three elements ever since. Drawing from the various skills and techniques he's been acquiring over the years, he strives to create unique, inspirational and original work that captures the history of African people and the mind-set of the younger generation. As a Canadian immigrant and a Nigerian in Diaspora, he tends to focus his art on the juxtaposition of unrelated images to produce new meaning. His personal experiences such as the religious conflicts plaguing Nigeria have also had an impact on his work. Ultimately, he would love his work to offer insight into the thoughts of the new generation of artists emerging out of the Diaspora. He wants to tell a different story with his work, one that captures the complexities of his African and Canadian heritage as well as sparks the conversations that can inspire change and build a bridge of unity. Jude Ifesieh was born in Nigeria, he first came across a pencil at the age of three and has never quite let go of it since then. In 2011, Jude moved to Canada to study Digital Animation at Centennial College. In Canada he has shown his works at the Toronto Library Exhibition; Paint spot Exhibition, Edmonton; Art Vancouver Exhibition to mention a few. Through his travels,notably in the U.S. as well as Australia, his art has been expressed as life -art is synonymous with healing! As an artist, he has developed pieces using a range of colors with unique grass-like strokes. This is a time-consuming process, as I layer and build up the images step-by-step. I have experimented, not merely to create images or figures in true realism; but rather with careful brush statements in strokes, movements that express the energy of the subject. My work involves a synthesis of multiculturalism and environmental themes. “Abstract Expressionism” and “Expressionism” is a gallery composed of pieces by various artists that use abstract painting to share their emotions and experiences. Sari lets the experience of creating guide her, beginning with a rough wood panel and finding inspiration in the shapes and patterns the wood imparts. She doesn’t limit the process to any specific media, preferring to play with all the materials that interest her (the condition of her studio shows her as both a treasure hunter and a hoarder). Her work often encompasses inks, acrylics, vintage papers and fabrics, natural materials, pastels, charcoal and graphite. She is engaged in a long standing love affair with beeswax (encaustic), and is always finding herself coming back to it. Sari’s works explore the beauty of imperfection, ripping and distressing pattern and geometric shapes to explore how it feels to loosen them up. Her work is the raw product of my creative expression that is one big rant, song and personal meditation. Steve Rose is a graduate of OCAD with a major in drawing and painting. He has exhibited his work extensively and has a diverse and experienced background as an artist/educator. In addition to an active independent studio practice, Steve enjoys teaching and lecturing on art and art history. Steve is also involved in mentoring less experienced artists and various artistic collaborations. Pamela Ozery was born in Kent England on July 31st, 1942. She was a wife, mother, nurse and an inspiring painter. Toronto became Pam’s final home after residing for many years in England and Israel. Painting was an inseparable part of Pam’s life from a very early age. A nurturing heart fostered her ability to connect with every brushstroke, to express her creative energy. “Her hands were slender and skeletal, but the energy flowed warm and powerful through them. Her paintings were the product of this flow” – Alon Ozery. Pam grew from a young talented painter to a mature and refined painter, where her works emulated abstraction. Emotion fuelled motivation to continue painting and her peers respected the unique and abstract qualities demonstrated on each of her artworks. Pam leaves behind a legacy of inspiration and passion for the arts through her artwork, family, and friends who knew her to be an accomplished artist. Catherine Shea was born in Toronto, Ontario and began her study of visual arts at Havergal College and Ridley College, graduating with a Bachelor of Arts from the University of Toronto. In 2005, Ms. Shea co-created “Art Outside the Box”, with Unilever Canada in a national arts campaign which featured Catherine’s artwork. This successful project spawned a series of abstract art workshops. In 2006 she would bring her art back to Toronto to Designers Walk, where her work was featured in select gallery showrooms. 2018 also marks the launch of Catherine Shea Studio’s art mentorship exhibition featuring students’ students’ original artwork based on Ms. Shea’s workshop series. Currently Catherine teaches at The Granite Club, The Toronto Cricket Club, Freehand School of Art, and Artbarn School. Ms. Shea leads therapeutic art workshops, and private lessons for both adults and children at her studio in the Yonge & Eglinton area. Andrew’s paintings are about how the eye sees, how the mind sees, and the intriguing play between the two. A painting is a plastic construction of form and colour. It is our mind, seeking meaning, that desires subject matter. Andrew exploits this duality. First, it is possible to have an intrinsically poetic experience of the basic elements of a painting. As well, we have an equally authentic experience, through the associations the mind makes of a painting that may bring to mind a landscape we recognize or a metaphysical perplexity we know. The paintings are colourful and abstract. Working with acrylic paint in repeated layers, Andrew creates images evoking a sense of recognition or association that testify to the emotional and psychological power of the paintings. Suyin was born in Montreal, Quebec and now lives in Toronto. She has been painting seriously for the past 4 years. Trained at George Brown College for Graphic Design and slaved away in the cubicle jungle in the financial service industry until she escaped. She began painting 2014 to balance out the cubicle culture that permeates our society. Suyin currently is in school full time at York University and pursues art as a serious hobby. Suyin’s art is mostly abstract influenced by many artists from Egon Schiel to Impressionism and everything in between including whimsical illustrations from Ralph Steadman. She started with acrylics on wood or canvas but, later found that she prefers to use oil pastels and India ink on chalk paint on paper or wood. Mirren Hinchley has always been passionate about colour and how it can create very different effects on people whether it be in what you are wearing, the colour on your walls or the furnishings in your home. ? She decided to turn her passion to painting and found that abstract art has allowed her to express her creativity in many different ways every time she starts a new canvas. "Chaos Theory" is a collection completely curated by Yonge-Eglinton born and bred artist, Catherine Shea. "Nature" is a gallery composed of pieces by various artists that reflect the natural landscapes and aspects of our natural world that uplift us and bring us peace. Complete with acrylic and oil paintings and photographs. Toronto native, Joan has a Fine Arts degree from the University of Toronto and taught High School Visual Arts for many years. She has devoted herself to painting mainly in oils, since 2004. Her realistic works include both nature and the human form. She has been in several group shows and has joined ?and exhibited with: The Bayview ?Art Tour, The ?North Toronto Group of Artists, The Scarborough Arts Guild, The North York Visual ?Artists, The Queen West Art Crawl, and The Artbarn. Currently, she is Past President of the North York Visual Artists and an Executive Director for the North Toronto Group of Artists, and the Bayview Art Tour. Joan is also available to teach workshops for arts groups as well as privately. She teaches at the Artbarn and Artist’s Garden Cooperative. Her work is in many private collections. Jacquelyn Sloane Siklos studied at the University of Toronto, receiving a B.A. in fine art and art history, and graduated in Graphic Design and Illustration from the Ontario College of Art and Design (OCAD) (1995-1993). Most of her work explores the accidental and imperfect, and all of her series share an intense love of colour. She uses a variety of different cameras and techniques to create her images, including toy cameras – Lomo, Holga – and a digital SLR. Her work is available for sale at Canvas Gallery in Toronto, and on the internet through Zatista. Mariana is a Toronto based artist, native to Chile and migrated to Toronto in 1977. ?She studied drawing at OCAD but is mostly self-taught. Mariana’s paintings have been exhibited at the Distillery District and Art Walks in the upper beaches area. She also created a program called Mood Painting for Culture Days in 2017.Her paintings are images of real and abstract life experiences mostly in blue. Being born by the ocean in Vina Del Mar Chile, the connection stayed with her and she is attracted to Toronto’s waterfront. Vina Del Mar Chile has an urban landscape much like downtown Toronto. Places and things in Toronto’s harbourfront such as boats, wildlife and shoreline have a big influence on many of her paintings. ?One of her painting was acquired by Tridel & Hines Aquavista Bayside Toronto, and is now part of the ongoing bayside revitalization project. Alexandra Iorgu was born and educated as a fine artist in Valcea, Romania. Her early artistic training included drawing and painting, ceramics, sculpting and art history. Alexandra has shown her work in numerous group sows and participated in international art and exchange programs. In 2000 she moved to Toronto where she completed her Bachelor of Design at the Ontario College of Art and Design. Her work is heavily influenced by her cultural background, and her travels throughout Europe. Alexandra brings a sense of clarity and truth to her work. It is both expressive and colourful. Mandi always had an interest in art. She started with drawing, painting and then transitioned into photography, which helped focus her interest for art and technology. Mandi grew up in, and around the town of Collingwood, Ontario, where she grew fond of being outside and taking photos. Others recognized Mandi's love for photography and encouraged her to pursue it. She eventually moved to Toronto to study photography and has continued to stay in the GTA since graduating. She has traveled to various countries, such as Chile, Ecuador, and Thailand, and plans on traveling to many other places, including as much of Canada as possible. Mandi primarily photographs landscapes, but she also enjoys capturing portraits. Thiviyaa is an artist from Toronto, also known as Art By Thiviyaa. She works hard to create pieces that speak to the beauty of the world around us and how it moves her. She aims to weave stories for others, immersed in the mystics of Mother Nature. Imagine a world untainted by humans and how Mother Nature was intended to be. Her artwork captures more than a mere moment of nature but its fluidity and movement through time. It's a narrative. Melissa’s abstract paintings include a bold use of colour and texture. She includes various techniques in her paintings to create movement and feeling. Melissa’s paintings are in private collections within Toronto.? "Digital" is a nod to the graphic and mixed media designs that are increasingly becoming part of the visual arts landscape. tỷ lệ cá cược bóng đá trực tuyếnwww.matthewcatalano.com? Born and raised in the shadows of Detroit’s art deco skyscrapers and surrounded by the beautiful, empty remnants of a lost heart of industrial America, Scotty grew up daydreaming of city life, both past and future. By capturing the optimism of bygone city builders, he heroes Toronto in an aesthetic it is not often associated with. His collection of colourful, bold and eye-catching illustrations provide the capital city, a colonial backwater in the early 20th century, with a romanticised history. Torontonians are often surprised and delighted to discover his cheerful work. Scotty lives in Mount Dennis, Toronto and still daydreams of the future cities of the past. Daniel Salij's values?the arts. He has been revived by?great ?works?of?art?and in?return offers?his?own simple, honest, sincere expressions. He sings,?not?to?appeal to the musical, but to?the humane. His?song?is a statement?of intent. Its primary?intention?is not as?a?pretty?form,?but more primal than that. ?It?is?an explanation of?his essence. ?He?draws, not to be technically accurate,?but?to?convey?a message. ?It?is akin?to a cave painting, more necessity than aesthetic. ?He?dances as the body?dictates. He is merely?responding to?an inner drive. ? He does not try?to?create art. Art is a natural function?of his?being, and it?is as service to his?true self?that?he creates. "Wildlife" traditionally refers to undomesticated animal species, but has come to include all plants, fungi, and other organisms that grow or live wild in an area without being introduced by humans. The pieces in this art crawl pull inspiration from all types of wildlife on this planet. Marina Nazarova is a Russian-Canadian visual artist and illustrator based in Toronto. She holds a BFA in Painting from Emily Carr University of Art and Design, Vancouver, British Columbia. In her figurative paintings she mainly uses oil on canvas and ceramic tiles. Recently she has been taking her art practice outside of her studio to do murals indoors and outdoors. The majority of Marina’s work revolves around people and spaces, as she investigates themes of personal identity, duality and shifting perceptions. She draws her inspirations from everyday life and memories. She tends to explore familiar imagery suggesting a subtle transition from one narrative to another. Adrian Hayles is a Toronto-based illustrator who is known for works such as the Reggae Lane mural in the Eglinton-Oakwood community and the Mount Dennis mural in the Weston-Mount Dennis community. At the tender age of nine, Adrian discovered the expressive nature of the visual arts. With his continued artistic development, illustration became his deepest passion and talent, launching his career more than 10 year ago. His style is provocative and inspiring and defies categorization. Blurring the lines between graffiti and ultra realism, Adrian’s voice and vision is instantly identifiable. His works include countless portraits and illustrations for various magazines (including Peace and Business Edge) and collaborations with the City of Toronto to develop murals for vacant community spaces. Ella is an ?artist, ?illustrator, ?and ?graphic ?designer ?based ?in ?Toronto. ?As ?a ?child, ?she ?was ?often ?lost ?in ?made ?up ?imaginary ?worlds, ?and ?as ?an ?artist, she ?seeks ?to ?explore ?those ?imaginary ?worlds ?and ?bring ?them ?to ?life. ?With ?my ?ballpoint ?pen, ?I've ?been ?able ?to ?create ?little ?doorways ?to ?those ?worlds, ?where ?you ?can ?glimpse ?into ?the ?imagined ?and ?surreal, ?into ?stark ?black ?and ?white ?dreamscapes. ?I ?believe ?that ?this ?is ?the ?true ?magic ?of ?being ?an ?artist ?- ?being ?able ?to ?bring ?to ?life ?a ?part ?of ?the ?imagination. ?With ?drawing, ?there ?is ?nothing ?that ?is ?impossible! Andrea Vela is a Peruvian community artist and self-taught illustrator who moved to Toronto in 2015. Her work is inspired by Amazonian culture and is influenced by the na?ve genre. Andrea's colorful illustrations explore folk culture and the connection with the human condition, femininity and nature. Her love for storytelling has led her to publish a picture book in China, and self-published a variety of zines in Spanish. As a community artist, Andrea has designed and led different workshops that combine art and social issues, with the goal of shaping the mainstream discourse on gender, culture and citizenship. More of Andrea Vela's work can be found at tỷ lệ cá cược bóng đá trực tuyếnwww.isallegra.com. Thank you to our 2018 partner organizations FOR PARTICIPATING in the selection of artists. Artbarn School is located in midtown Toronto, along the Eglinton Way (Eglinton Avenue West at Oriole Park). For over 12 years, they have been offering art classes for adults and for children as young as one year old. In 2005, Mary Thelander, Frith Bail and Linda McMaster envisioned a welcoming not-for-profit community art school. Since then, under Linda’s leadership, Artbarn has inspired hundreds of budding artists of all ages. Artbarn’s classes are open to people at every stage of development – from the terrified beginner to the hobbyist looking to take their skill further. In 1992, four socially conscious artists came together in Toronto’s Oakwood-Eglinton area. They wanted a place to make art – a place they could see and be seen, and make art with everyone. 25 years later, Art Starts has become a catalyst and a proven model for arts-based community development in Toronto. Art Starts now works in 5 under-resourced neighbourhoods across Toronto, but is still active as ever in the Eglinton and Oakwood area. Scarborough Arts (SA) is an evolving non-profit, the only arts organization of its kind specifically serving the Scarborough community. Founded in 1978, SA was established to promote artists and artistic growth in the community. Over time our organization has expanded its mission to also include community programming (children, youth, seniors programs). Since 1992 we have been located at a city-owned property on the Scarborough Bluffs, which hosts office and gallery space for Exhibits. As we celebrate our 40th Anniversary, we will continue to bring individuals and groups together to create and cultivate innovative arts and cultural programs in Scarborough. UrbanArts is committed to the goal of building inclusive, engaged communities by enriching peoples’ lives through the arts, culture and heritage, with programs, services and resources delivered within the former City of York boundaries, with a focus on York South-Weston. Catherine Shea displayed at 292 Eglinton Ave. W.
Quentin Vercetty displayed at 1563 Eglinton Ave. W.
Gallery City is a joint initiative of tỷ lệ cá cược bóng đá trực tuyến, Crosslinx Transit Solutions – Constructors (CTSC), the seven Eglinton Business improvement areas, the Yonge Eglinton Centre, Eglinton Square, and Eglinton businesses between Weston Road and Victoria Park.